The second collection of original Solar Pons stories by Basil Copper. This 9th Pinnacle paperback was published in 1979 and has one of my favorite Pons covers. Hark! Solar Pons is Back! And the chase is on . . . join the hunt as this superlative sleuth pursues his quarry through the tangled webs of intrigue, crime and murder. 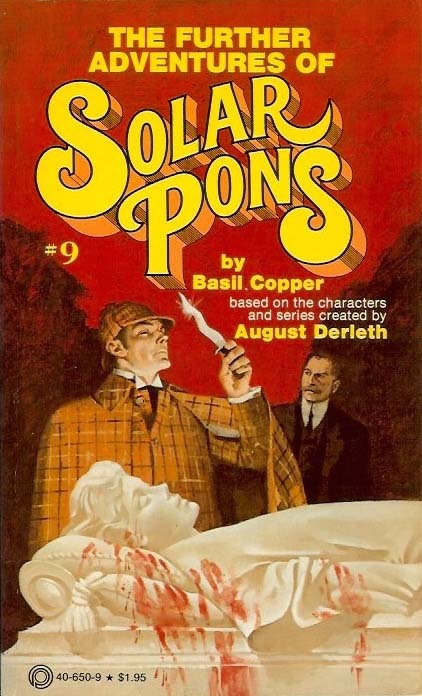 Faithful followers of Sherlock Holmes and mystery lovers alike will delight in Basil Cooper's compelling storytelling as he continues the grand tradition of August Derleth's unerring detective genius, Solar Pons. This literary descendant of Sherlock Holmes is the true heir to the incomparable Master . . . so the chase will continue, as long as villainy and crime must answer to truth and justice! Also see: The Adventures of Solar Pons (1976), The Return of Solar Pons (1975), Mr. Fairlie's Final Journey (1976), The Dossier of Solar Pons (1979).